If leaves are too large we will remove them before delivery. If you'd like to discuss this please call us on 01376 561212. Shade/partial shade. If in full sun, be sure to give plenty of water. Tree ferns such as the Dicksonia antarctica are getting more and more popular here in the UK and can prove a striking addition to your garden. 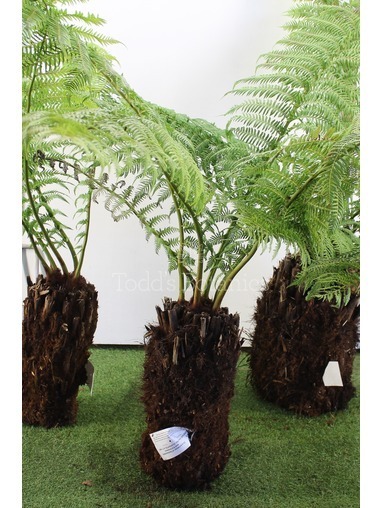 These best-selling tree ferns boast stunning thick, textured trunks and, as the season grows, will unfurl long luscious fronds. 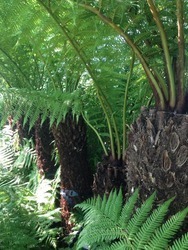 Tree ferns look fantastic when underplanted with other architectural-type plants. 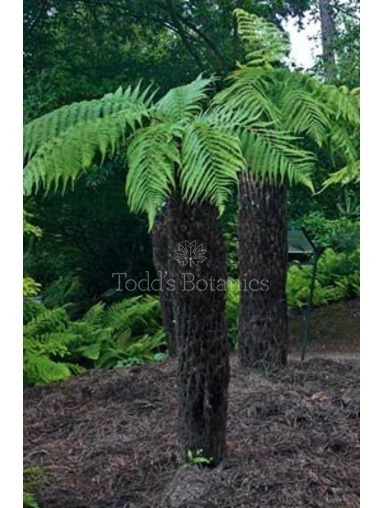 Used singly or planted in multiples, tree ferns add elegance, shape and a touch of the exotic to your garden. Although native to the likes of Australia and New Zealand, Dicksonia Antarctica enjoy a semi-shaded position (although they will still thrive in full sun provided they are given plenty of moisture during the hottest months). With the increasing popularity of tree ferns in UK gardens, sustainability is more important than ever. At Todd's Botanics, all of our Dicksonia antarctica come from sustainable sources in Victoria and arrive tagged with proof of origin/sustainability. You can find more information on caring for Dicksonia antarctica in our detailed tree fern care notes. We provide a printed copy with every tree fern we dispatch. Tree ferns are a full shade plant - their natural habitat is beneath the tree canopy of mature forests. They prefer a sheltered, humid position with shade for at least part of the day. However, they can cope with full sun if they have sufficient water. A humus-rich soil is ideal that retains moisture. Wind is their enemy - try to choose a sheltered site which is not particularly windy. 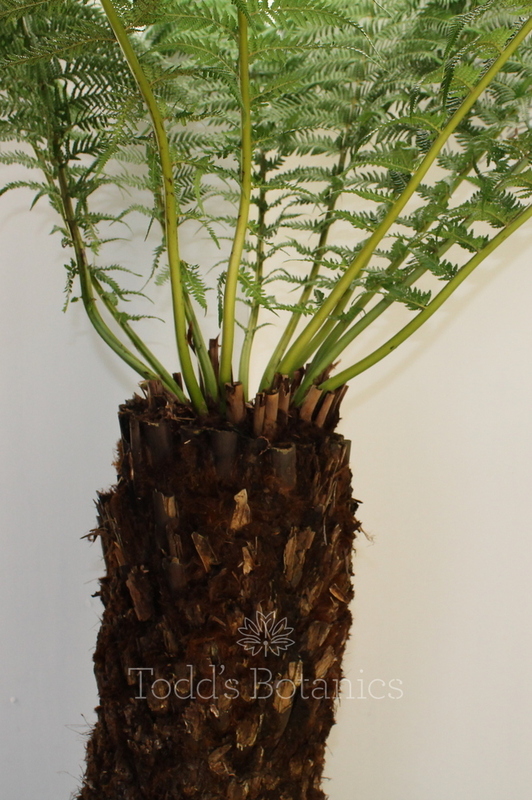 Although it was previously thought that tree ferns did not re-root once transplanted to the UK, they have been known to root over a period of time. However, they do not rely on these roots - they get all their nutrients and moisture through their central growing point or 'crown'. Tree ferns are extremely slow growing - only increasing trunk height by 2.5cm a year. 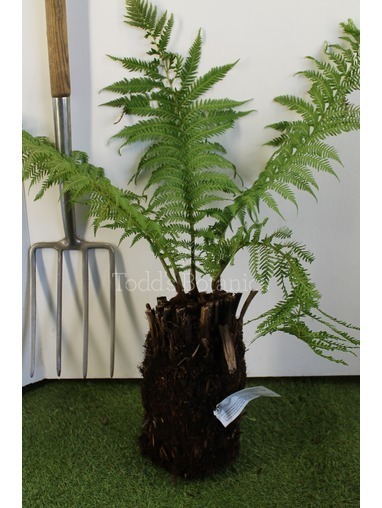 Therefore, when making your selection choose a tree fern for immediate effect that is instantly in proportion with the rest of your planting scheme. Remember to allow for the fact that part of the trunk will be buried to ensure the tree fern is stable when planted. Tree ferns thrive on a liquid feed such as Phostrogen every two weeks or so from Apr-Aug. It is very important that is only a quarter strength of the recommended dose. This should be watered in to the crown. We have also heard of them liking a tablespoon of sugar in their crown in the spring - it doesn't hurt to try this one! 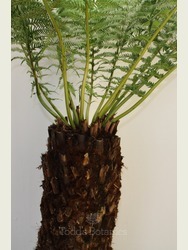 Remove fronds as necessary once they have gone brown. Depending on their position and the amount of sun they receive, water the crown and trunk accordingly throughout the growing season. Ideally the trunk should feel damp to the touch most of the time. The only one to be aware of is squirrels eating the new 'knuckles' before they emerge. A crown of chicken wire will protect against this - just make sure it is removed before the fronds begin to unfurl. We have known wrens to nest in the side of them too, although hardly a pest! Previously, we have been quite relaxed about winter protection, as in our part of the world a typical winter low of -6 to -8c is not a problem if the tree fern is already sited in a sheltered position. However, the winter of 2010-11 was one to remember so we would definitely recommend winter wrapping. The top 60cm of the tree fern is the part to wrap, using a breathable material such as a good 10cm thickness of straw contained by hessian or horticultural fleece.